Maybe it’s difficult to understand the obsession locals have over hummus food, but once you try it, and after a couple of dishes, you will understand their craving. When on tours to Israel, be sure to check some of the best hummus places, try some dishes and who knows, maybe you too will become a hummus fan (if you aren’t already). This ultimate Israeli fast food made from chickpeas is full of iron, protein, minerals and vitamins. Even though it’s high in fat, most of it is unsaturated. This healthy fast food is definitely worth giving a try to get the most from your trip to Israel. 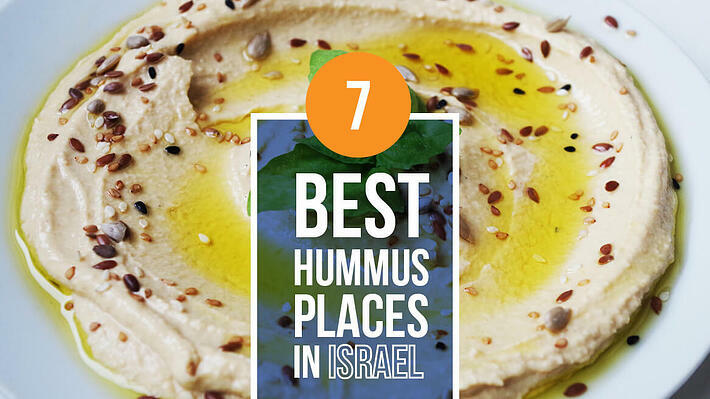 Here is the list of top seven hummus restaurant in Israel. Bon apetit! If you’re looking for a place that has passed a family’s recipe from generation to generation, this might be the right place for you. People come to Jaffa and wait in line to try this hummus, served with bread pita, very spicy green sauce and sliced onion. Always greeting their customers with a smile on their face, this place has become the favorite one for many visitors. The place serves hummus with or without ful, masabbha or a triplet- a combination of the three. The venue is quite small, only five tables for four people inside, and two small tables outside. Another excellent hummus place in Tel Aviv, is Abu Adham. This vintage hummus restaurant is located on Carlebach Street, and has served authentic local hummus since 2003. The hummus is prepared with the texture of their famous Galil recipe, very smooth and fresh every day. The restaurant serves four kinds of hummus for 25 NIS: Hummus Ful, Mashshewea, Hummus with garbanzo beans and The Shlisha (ful, garbanzo beans and meshashawa). For 35 NIS, you get three types: Hummus mushrooms, Hummus with meat and plain Hummus. This hummus restaurant is very popular among local celebrities and tourists. Its popularity comes with its quite thick hummus with unique texture. Not being overly spiced, it allows you to feel the real taste of the chickpeas. Besides very delicious hummus, the place also serves salads, eggs, chips, falafel, tahina, fava beans, and other add-ons. The restaurant is open until 2 am every day except Friday, and is always full with locals, who adore the place. Bahadonas is located on the high-tech area of Rival Street in Tel Aviv. It is a chain of restaurants, so you might find them outside Tel Aviv as well. It serves hummus with different toppings. The standard hummus doesn’t have any additions; smooth texture and mild flavoring. Topping options include: hummus with ful (fava beans stew), hummus with mushrooms and Mesabaha (hummus with tahini). The place also serves a combo of hummus with salad or falafel at discounted prices. For the order above 80 NIS, you get 10 falafel balls for free. This hummus restaurant is located on 13 King George Street in Jerusalem. This secret tourist attraction does not only serve hummus, it is also a kosher place; it is a family business, running for almost forty years. The guests have an option to order the standard hummus, but also to enjoy Kubeh soup (special dumpling-like morsels). The reasons why guests always come back for more is the fresh food and fantastic and very tasty, yet not watered down hummus. Friendly and fast service makes your stay even more enjoyable and pleasant. One of the most famous places in Akko is Humus Said, a relatively large venue, compared to the others which are mostly small. This restaurant has been serving hummus for about 35 years. The space, filled with sunshine due to its large windows is very popular among locals and tourist. There is always a line of people waiting for their place and their portion of hummus. Aside from hummus, Mahluta (a tasty dish of spiced and cooked ful) and Mashawsha (ingredients are similar to hummus, but the texture is different) are also served. Though very simple, this place is full of profusion and generosity. Mashawasha is probably the best hummus restaurant in Tel Aviv, located on Pinsker Street. This charming and sunny café-style hummus joint serves mashawasha, a type of hummus which includes whole chickpeas and so gives a creamy texture. Homemade pickles, fresh salad and warm pita are also on the menu. What regular visitors recommend is trying mashawasha with onions, fried mushrooms and tehina- a delicious experience you’ll never forget. Turkish coffee and various kinds of juice can be ordered to fulfill your meal. Helpful and really friendly staff and lots of satisfied guests give this place a great energy and make it definitely worth visiting.